This installment of the „…of Porphyra“-series clocks in at 52 pages, 1 page front cover, 1 page editorial, 8 pages of SRD, leaving us with 42 pages of content, laid out in 6’’ by 9’’, pamphlet-style, which theoretically allows you to fit up to 4 pages on a sheet of paper, should you choose to print this supplement. So, what do we get here? 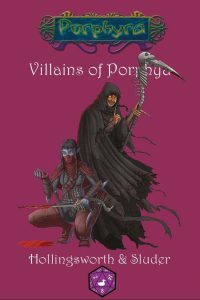 Well, basically what it says on the tin – this is no NPC Codex-style supplement that presents nameless adversaries and mook-fodder, but instead should be considered to be a collection of named and framed villains, ready to wreak havoc on your PCs. This obviously means that they all get their own piece of aptly-written prose, as well as statblocks, with the latter making use of Porphyra’s impressive cadre of creatures, races and content in general. Note that you do not need to own Porphyran books to use this, though! There is also a pretty neat Porphyra wiki, just fyi! A total of 16 dastardly villains are provided within, so let’s take a look, shall we? For brevity’s sake, I am going to assume a degree of familiarity with Porphyra’s lore and races – should you be intrigued by the unique Patchwork plant, click on the “Porphyra”-tab of my review on my homepage, and you’ll have a list of files (and reviews) depicting more in terms of both crunch and lore. We begin this supplement with Lady Daivona Scovalyx, a CR 17 inveigler erkunae investigator (mastermind) of the amazing erkunae race, still one of my all-time favorites of the setting for the cool, old-school non-Tolkien-ish vibe they have (Vance,Moorcock); anyways, she comes, as befitting of her stature, with her own pact creature (think: racial kinda-familiar), and is followed by Vsehnian, the Betrayer – a CR 11 dhosari rook; dhosari are btw. the servant race of the erkunae, but this clever individual, though aligned with Daivona, can make for a potent foe on his lonesome, clocking in at CR 10. Fhemish Darggun is a half-cyclops archaeologist bard at CR 16 – the most ruthless weapon’s fence and dealer of Giant’s Retreat – who, ironically, really likes civilization, even though his trade could potentially be considered to be contrasting with its establishment, or, more importantly, maintenance. Ursk the defiler would be a CR 9 skulk oracle, who champions, in a twisted way, freedom. Freedom from fear. Dignity. Reason. Life. With darkness-themed abilities and vampiric tricks, this fellow is twisted in a cool way. At CR 16, master Gyro is a boggle spell specialist arcanist, comes with notes of the uncommon elf lord’s battle armor spell from Kobold Press’ Deep Magic, as well as with bracers of defense item-class. I did grin when seeing the CR 10 augmented half-giant telekinesis/force specialist Brutus Half-forged and the CR 8 aberrant aegis/fighter multiclass from duergar stock Rosca Hatemonger. We end the supplement on a definite high note, with Ibuel the Frightlover, a fey creature xeph dread with 15 levels and CR 16. The pdf comes with a bonus file depicting the Agropelter, penned by Mark Gedak and Perry Fehr, a CR 3 fearsome critter magical beast, a wiry apelike thing whose arms have no middle joints, capable of quick bursts of speed. Solid creature that makes for a nasty artillery at low levels. Editing and formatting are very good, I noticed no excessive accumulation of grievous glitches. Layout adheres to a 1-column standard, is pretty printer-friendly and sports the classic purple highlights. The pdf has no interior artwork. The pdf is fully bookmarked for your convenience and ease of navigation, though the bookmarks don’t note the CRs, which, since the villains are listed in no order I could glean, represents a slight usability detriment when in a pinch. Justin P. Sluder and Aaron Hollingsworth make for a good team, at least judging by this pdf. Justin has crafted some of my favorite NPCs/villains ever for the Faces of the Tarnished Souk-series, and his talents at making complex NPCs shows in quite a few of these villains, though not all of them. Still, the means by which this book employs Porphyra’s rich canon of options is nice to see indeed. The villain-motivations also are surprisingly diverse, the brief flavor texts lending depth to them. If anything, I did wish more than once that we had a tad bit more space per villain to further add to their myths. That being said, the use of diverse and interesting material herein and the obvious joy in some of the combinations does render this collection worthwhile – the enemies herein *will* be challenging for your group. And hey, you can’t ever have enough adversary-statblocks, right? Right! In short: Totally worthwhile if you’re looking for some tough foes to throw at your players! My final verdict will clock in at 4.5 stars, rounded up due to in dubio pro reo. You can get this collection of dastardly foes here on OBS!